The 'Model One' club, in Dublin, had been run by D1 in various venues over the previous few years and there were discussions about creating alter-egos for the DJs involved, characters possibly like the aquatic immigrants of 'Drexciya', or the Interstellar Fugitives of 'Underground Resistance'. 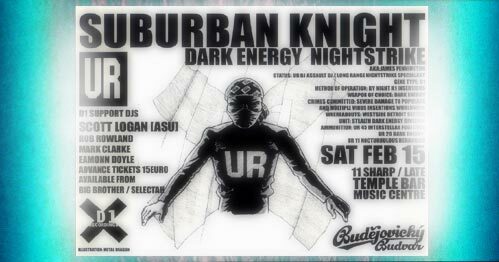 Although the project ultimately remained conceptual, there were several fliers made, for 'Suburban Knight' of 'UR', and DJ Bone. Note: This influence of independent electronic music is one of the things that led me, as a sideline to the main content of this website, to begin to build the World Indexes, as a way of mapping this aspect of the planet's creative activity.